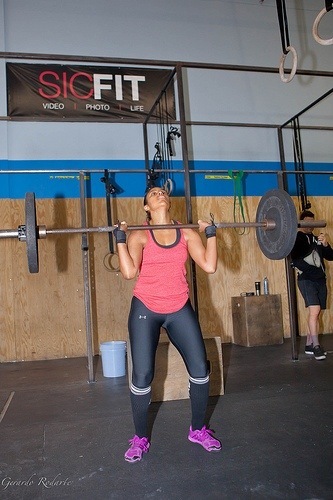 Lyndy L. handling some shoulder to overheads in 13.2. 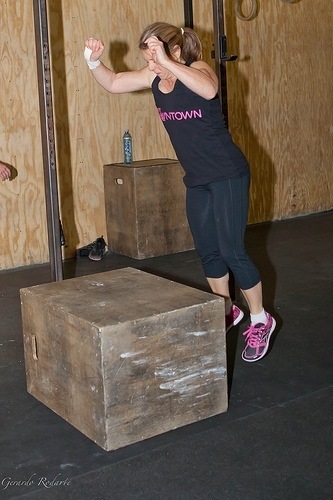 Kim W. in mid air during the box jumps on 13.2. ***ATTN ALL CROWNTOWN MEMBERS – Yoga classes have started! Every Thursday at 8:30am. Take advantage of this CF member perk. March 9-April 6: Every Saturday for five weeks we will be hosting an in house competition style event. The workouts will be the Reebok CrossFit Games Open workouts. If you are registered to compete, please make sure you choose a heat time to perform your workout. If you are not registered, please show up between 7-10am to volunteer your time to help support your community. After the competition you may also get your workout in. May 17-19: Reebok CrossFit Games SoCal Regional Competition at Del Mar Fairgrounds. Top 48 men/women and the top 30 teams from the SoCal region compete for a spot to advance to the finals at The Home Depot Center in July.